Enerpac (A Division of Actuant Corp) introduces a new range of flange alignment tools designed to enhance safety while reducing set-up times and installation costs across a host of onshore, offshore, and pressure vessel pipeline applications. 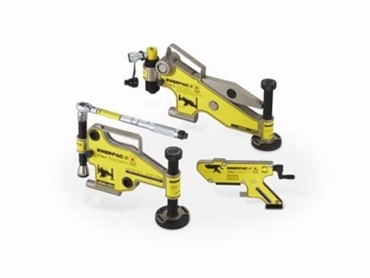 Enerpac’s latest ATM-Series of flange alignment tools consists of the ATM-2, 4 and 9 Series mechanical and hydraulic tools, which are designed to line up the flanges correctly within minutes, rectifying misalignments safely and without the need for an external power source. The new tools are suitable for use on most ANSI, API, BS and DIN flanges and can be used in any position, horizontally or vertically in applications across oil and gas, mining and energy, construction and infrastructure, manufacturing and process engineering, and water and waste water. These tools also enhance safety, efficiency and ergonomics by eliminating the need for slings, hooks, chains or lifting gear during use. ATM-2 10kN and ATM-4 40kN mechanical flange alignment tools are lightweight, self-contained solutions that can be easily transported and used in remote locations with limited access. While the ATM-2 model has a maximum lifting force of 10kN, handles bolt holes as small as 16mm, and weighs 1.6kg, the ATM-4 can apply 40kN of force, is designed for bolt holes as small as 24mm, and weighs 8.6kg. The ATM-9 90kN hydraulic flange alignment tool features the same functionality as the smaller tools, but provides much greater aligning power. The hydraulic-powered ATM-9 has a lifting power of 90kN, is suitable for bolt holes down to 31.5mm in diameter, weighs 14.5kg and comes in a kit with an Enerpac P-142 two speed hand pump and a hydraulic hose. According to Enerpac, misalignment of flange joints often occurs when pipes are separated for testing, routine maintenance or during shutdowns. Earlier methods of flange manipulation could be hazardous and time-consuming because they required a lot of manual lifting, and could also damage the flange bolt holes. Key benefits of Enerpac’s new alignment tools include safety, ease of use, elimination of damage to the flanges, and simple access in tight spaces. Operators and bystanders are kept safe, reducing potential injuries associated with the use of alternative solutions. Designed to be used by a single operator, the tools can be employed on many popular flange sizes. Enerpac distributes a broad range of non-impact professional bolting technologies globally.